British driver Oliver Turvey joined NEXTEV NIO – formerly NEXTEV TCR – for the final round in London in the first Formula E season and made an instant impression – two 9th places did not tell the story of how well he mastered a new car on a tricky circuit. He stayed with the team ever since and has established himself as a force to be reckoned with on the highly competitive Formula E grid. He has proven to be especially strong in qualifying and is constantly and successfully pushing his car to the limit. After kick-starting his career in 2004 with a 7th place in Formula BMW UK, in which he scored one race win, the Cumbria native finished 2nd in the same championship two years later, with five wins. After winning the prestigious McLaren Autosport BRDC Award, he graduated to Formula Renault Eurocup in 2007, where he finished 8th. A return to UK shores followed in 2008 where he finished runner-up in British Formula 3 to former FE competitor and F3 team-mate Jaime Alguersuari, Turvey taking 2 wins on the season. 2009 saw the Racing Steps Foundation-backed Turvey move up to Formula Renault 3.5, again with Alguersuari as team-mate, finishing 4th in the standings with 1 win. At this time he also became a McLaren test driver, a role he still holds to this day. 2010 saw a move up to GP2 and GP2 Asia, with a win in the Asia series and a championship position of 6th in both categories. 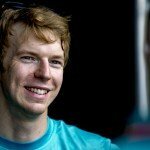 After this, his Racing Steps Foundation backing ended, and Turvey focused mostly on GT and endurance racing, apart from a solitary GP2 weekend as a stand-in in 2011. He is currently racing in Super GT in Japan and has also raced at the Le Mans 24 Hours in the last two years, winning the LMP2 class in 2014.